There’s something for everyone at Hopewell Theater this week! Thursday at 11 am parents and guardians of infants can get out of the house at our Crybaby Screening of The Land Before TIme. Thursday night, Rio Mira is an exciting recording collaboration between artists from neighbouring Ecuador and Colombia and fronted by singer Karla Kanora Oficial. Mike Dugan presents his nationally recognized one-man stand up show Men Fake Foreplay Saturday night. 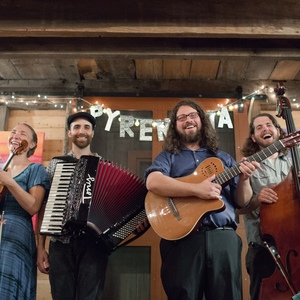 Sunday at 11 am Pyrenesia performs at our special Gypsy Jazz brunch, catered by renowned Max Hansen Kitchen. Film lovers won’t want to miss The Wife and JOHN MCENROE: IN THE REALM OF PERFECTION this weekend + a special presentation of TAWAI – A voice from the forest on Tuesday night as part of our ongoing The Art of Living Well series. Click here for more info!